I've gotten to the point where the zucchini is starting to take over the kitchen. When you find wayward zucchini hidden inside your box of raisin bran, in the dog's food dish, and piled in mounds on every counter top, you know it's time to take action. OK, so it hasn't really gotten that bad yet, but I could see where things were headed and I decided to take matters into my own hands. After zucchini bread, stuffed zucchini, ratatouille with zucchini and zucchini in my stir fry, I was completely sick of zucchini. I finally decided it was time for the ultimate in food disguise mechanisms. Sure, cheese covers over a multitude of wrongs, but even that was starting to wear on me. It was time for the big guns. It was time... for chocolate. The following recipe was taken from Garden and Hearth and it's fantastic. I took some to the pool yesterday and offered it to a friend's kid. I said, "B, would you like some zucchini chocolate cake?" She looked at me funny, but nodded. I gave her a piece and she scarfed it right up. Her mom asked her later, "So did you notice the zucchini in the cake?" She turned and looked at me in awe and said, "I thought you were kidding!" Honestly, you don't notice the zucchini except that the cake is moister and there's an occasional green sliver of zuc. skin popping out. I'm making my second cake already because the one I made two days ago is long gone. Wow. That's a huge zucchini in the picture. we were stepping out of the car as we came back from the airport from our michigan trip and there's a neighbor's daughter with that behemoth. we already had zuc in the fridge from before we'd left and zuc to be picked up at the CSA the following tuesday, but i couldn't very well say no to a neighbor that i hardly ever talked to and who i felt was trying to show some sign of neighborliness. ... hence the overwhelming amount of zucchini gracing my kitchen counters. Unusal and interesting recipe but sounds quite tasty! I have heard of Zucchini described in unflattering terms, both in terms of finding new and interesting ways of giving the stuff away to "Friends and Acquaintences" if you have a plant, and in terms of always feeling obligated to take one when offered to you, and thus the plethora of recipes for the stuff. 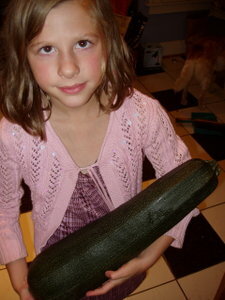 We've just eaten so much zucchini yet that we're going to turn to a living zucchini as well. But the idea of eating it with chocolate is quiet exciting. BTW, I remember "Deep Fried Zucchini" playing a part in a "White Spot" plate that I was quite fond of, called the "Grill and Greens". Yum. Some things about BC, I do still miss, and White Spot is one of 'em. Oh well. A past acquaintance of ours used to make wonderful zucchini pickles (or for those who live in America, a spread like jam only not sweet, a sort of chutney I guess) I am sorry now that I never got the recipe of her. It was delish. oooh, maybe i'll see if there's a recipe online for it somewhere. i've never made a chutney. that would be fun. you have to click on my recipe tag (in the welcome box near the bottom of my page) to see those in the list. the recipe box isn't really a tag box but an ancient content box that multiply has stopped using. here's a link to the pirogi we made. here's Spinach and Ricotta Pasta. I have a friend in Germany who has a similar recipe but they use sauerkraut instead of zucchini. It's to die for, once you can bring yourself to taste it anyway. I might have to try that recipe. But only when we have visitors as Alan doesn't eat chocolate cake - strange man. can you taste the sauerkraut in it? you can't taste the zuc. in this recipe. but with sauerkraut, there's more than just the taste of the cabbage. i would think it might add a bit of zing with the vinegar in it. You wash it first to get rid of the vinegar so the taste isn't affected too much by it. And it's lovely and moist. The main advantage of using sauerkraut rather than cabbage is that some of the cellulose has been broken down so the texture is better. LOL!! This is exactly how I discovered Arnold Palmer's zucchini bread recipe (in a celebrity cookbook my mom did for a charitable organization in the 1970s). My parents went out of town for two weeks, leaving me to watch over two little zucchini plants. Two little zucchini plants on steroids, or something - my Lord, but they multiplied and bore fruit. I fed my friends' boyfriends (and half the guys in a university dorm) on zucchini bread for a week!! Yikes. You have two things in it that I like. Chocolate and zucchini. Since I have some zucchini sliced and frozen in the freezer, guess I'll have to try it. Thanks for the recipe. you're welcome. tell me what you think once you've made it. 350 degrees. i can't remember what pan i use, nor how long i cook it. generally i cook cookies and cakes until i can pick them up and hold them sideways without them sliding around in the center. maybe the next time i make this cake i'll try to pay better attention to those two things so i can add them in here. in the meantime, if anyone else tries this and has the details, please feel free to add them in. The Zucchini cake recipe doesn' t tell you what temp to set oven and how long to bake for???? read through the comments. it's in there. isn't nearly everything cooked at 350? i have very few recipes that call for anything else.